A small, personal story with far-reaching resonance, Philomena starts with docile human interest and ends with a scathing look at the insidious social norms that cause long-term damage. Martin Sixsmith (Steve Coogan) is a former BBC journalist and political advisor who has lost his job after falling foul of the latest government scandal. With no immediate job prospects, he reluctantly accepts an assignment to research and write a human interest story. He meets Philomena Lee (Judi Dench), an elderly but sparkly woman desperate to uncover the fate of her son. As a teenager Philomena became pregnant out of wedlock and as a "fallen woman" moved into Roscrea convent, where she gave birth to a son she named Anthony, and signed away any rights to the child. She worked as an indentured servant until the nuns gave Anthony away for adoption by a wealthy couple. Philomena never saw her son again. Now, almost 50 years later, she desperately wants to know if he ever thought about her, or about his Irish roots. Martin and Philomena visit the convent but get no help from the current supervisor Sister Claire (Cathy Belton). Acting on a tip that the nuns used to sell the children to couples in the United States, they travel to Washington DC where Martin identifies Anthony as Michael Hess, a now deceased lawyer and political advisor to Presidents Reagan and Bush. Although Philomena is devastated that her son is dead, she is determined to know more about him by meeting his friends. Her journey will reveal the secrets that her son had to contend with, before ending at a most unexpected but shockingly familiar destination. An old fashioned road trip movie, Philomena starts as a mother searching for her son but ends with a more sweeping if backwards looking indictment of actions from a different era. The script, by lead actor Steve Coogan and Jeff Pope, takes rather broad shots at religion and specifically at what amounts to the trade in children practiced by Irish convents. While the tolerant character of Philomena herself presents a more balanced counterpoint, director Stephen Frears does tilt towards the cheap shots by failing to present a more balanced context of the choices that a young, single and pregnant woman would have faced in 1950s Irish society. In what is effectively a two character study, both Steve Coogan and Judi Dench are exceptional, delivering understated performances to bring to life two imperfect but well-meaning and extremely likable characters. Coogan plays Sixsmith as scarred by his unceremonious dumping from government, his natural journalist's mistrust now heightened to new levels of disengagement from caring. Dench combines the gentle pain of a mother realizing that time is running out for solving the one great mystery in her life, with the slightly nutty talkativeness that comes from a lifetime reading bad books and worse newspapers. 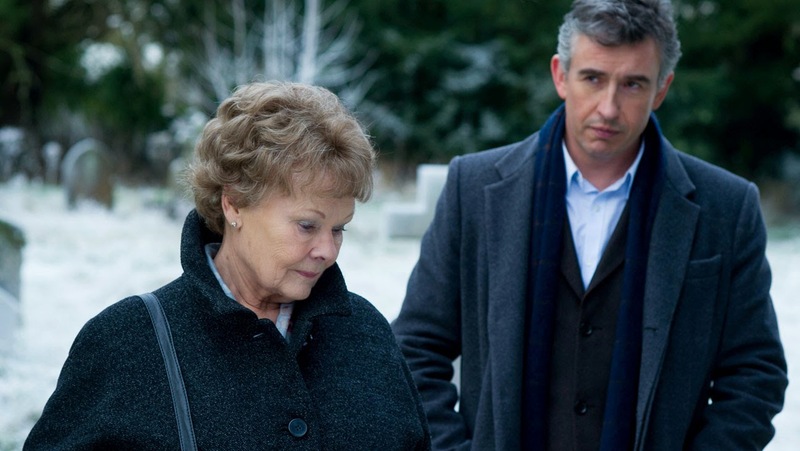 Philomena draws much of its power from the interplay between Philomena and Martin. She was sheltered by the nuns, and despite everything still appreciates the positive influence of the Catholic church, refusing to be openly critical, and finding justifications for the actions of the convent. He does not believe in God, let alone the value of any form of organized religion, and his caustic journalistic attitude creates a thick layer of skepticism in the face of any possible good intentions by the nuns. It is the combination of both attitudes that finally brings this journey to its conclusion, Martin's abrasive anger barging down the doors, but Philomena's more accommodating attitude walking through the archway of history to find solace, not anger. And not surprisingly, it is the circumspect mother, rather than the jaded journalist-politician, who possesses the wisdom of the ages.